I am so so excited to announce that I was able to contribute a little something to the Celebrate the Boy series over on Made by Rae this year! I fell in love with the series last year and when they announced they were looking for reader ideas for the 2011 series I felt compelled to come up with something. 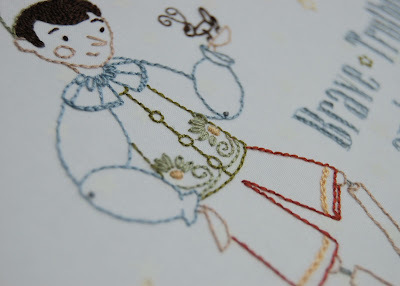 They have had so many fantastic sewing projects there but I figured I should probably stick with what I know best and come up with an embroidery pattern. I have had Pinocchio on the brain for awhile and this seemed like the perfect opportunity to get him down on paper and then stitch him up. I love this story for boys particularly. (Even though, I, as a girl, am quite fond of it obviously). I had a lot of fun taking a closer look into this story as I worked through my sketches. The story was originally written by Carlo Collodi in 1883. You may have seen the Disney version of this tale which is wonderful but different from the original story in many ways. Another movie version came out in 1996 and is just slightly more traditional though perhaps not quite as charming as Disney's film in my humble opinion. For this pattern design I mostly plucked the sweetness from the original story and it's many interpretations and left out some of the more dark and bizarre elements found in the original. Don't get me wrong - I enjoy the dark and bizarre elements just as much. I just figured people might not be as interested in stitching up things like menacing, coffin-carrying rabbits and other oddities like that. I probably just convinced half of the readers to go read this story and the other half to never ever pick it up. If you are entertaining the idea of reading the book, please allow me to recommend this one illustrated in such a captivating way by Sara Fanelli. Finally, I also have to mention the 2002 children's book release of this story illustrated by the one and only Gris Grimly. Would LOVE to get my hands on this but at $40 - $50 I may have to put it on the wish list for now. Or maybe I'll just wait and. watch. the. movie. holy smokes folks - I can't wait! What I like most about this story is that it touches on the idea that you can make mistakes (everyone does you know) but then make it right again. And, that being a boy is about being courageous, honest and helpful - not about being naughty or rude like some might imply when they sigh "boys will be boys". So, this is my little contribution to the celebration. Thanks Rae and Dana for letting me get in on all the fun! I so love this. There are not many projects that work nicely for boys, but this is so dear. How wonderful is this. I'm the musical director working on Pinocchio with a school right now for their spring production. We have our first show in a couple weeks. I now know what to make the director for a gift. Thank you so much for sharing. Holy cow, I love it! And wow - I'm now super excited about that del Toro adaptation. Oh I am so glad to hear this may be going on someone's "To-stitch" list! I admit my stitching isn't the best on my example so I look forward to seeing where other people take it (surely to better places). Thanks for the kind words everyone! That's such a beautiful design, Corinne. And I think you stitched it up quite lovely! Oh wow! I adore this! I love how clean the design is and it's just so charming!! beautiful beautiful work!!! 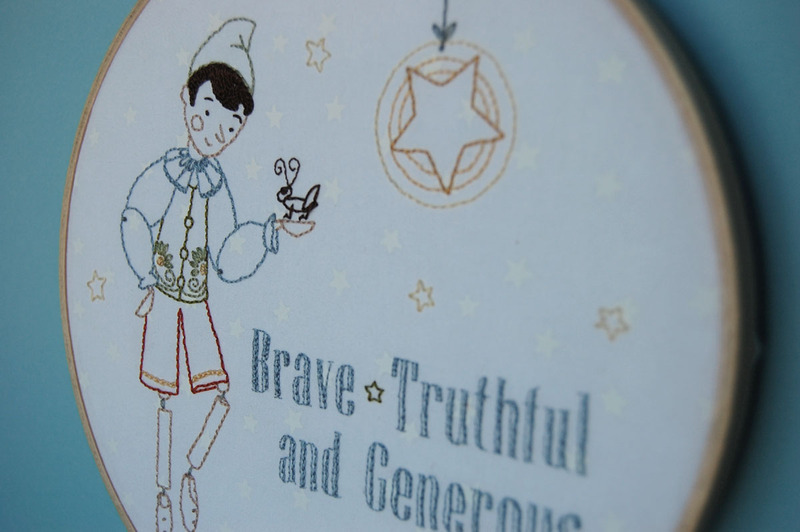 Pinocchio is an all time favorite, and your desing is perfect! I'm new to embroidery, so this is probably beyond my capability for the tine being, but it is fantastic! Thank you! I'm also thrilled to have found your blog via Made by Rae. Yay! Love this pattern! It's cute for girls too. I am overwhelmed after finding your blog~such beautiful ideas, such lovely work. 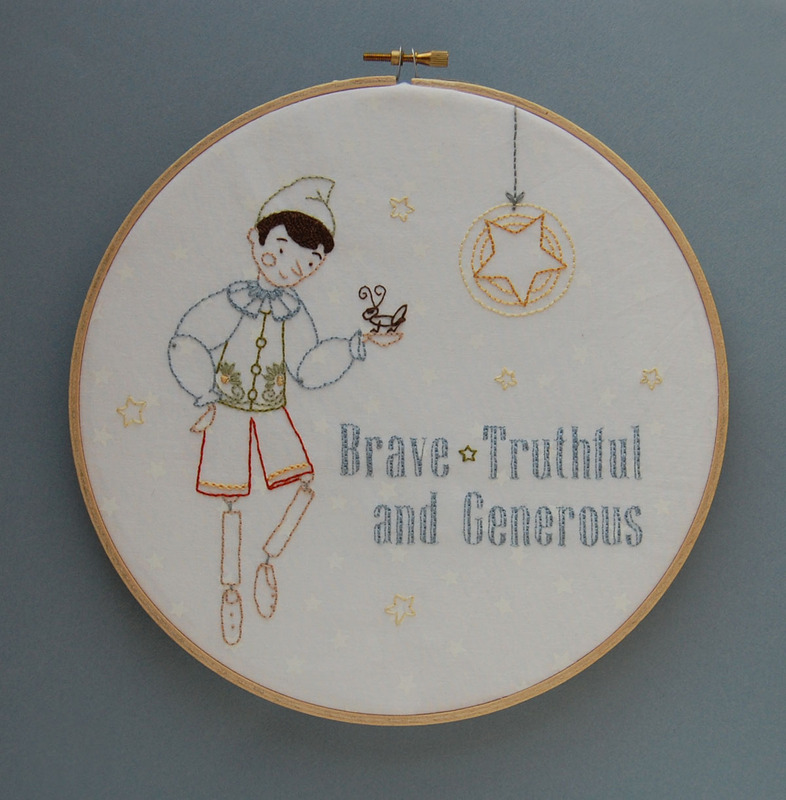 For many years I have watched as my mother has held a hoop and hand embroidered. I have vowed to carry on the craft she so loves, but, sadly is unable to do any longer. Thank you for the inspiration you give freely on your blog. And for the lovelies you offer in your shop.